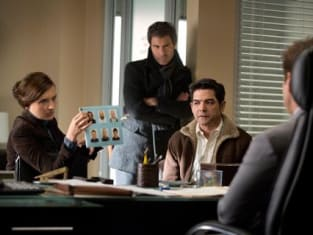 Perception Season 1 began with the daunting task of finding a way to associate schizophrenic and overly intuitive Dr. Daniel Pierce as more than just another super smart sleuth with that special "quirk." It took a bit, but by the end, Eric McCormick had solidified himself and proven that his character of Pierce was a different card from the pack and one worth watching. So I was a bit disappointed by "Ch-Ch-Changes" falling back into what felt like such a generalized case of the week, and one that seemed rather unbelievable. I loved delving into Pierce's psyche and watching him attempt to deal with his breakdown in the last season finale, "Light." It not only got to the core of the character, but pushed him to step up and get himself better. Seeing Pierce having been nine months on medication and in a blossoming relationship with his doctor Caroline (not Natalie, although there were moments I wasn't sure) was a great way to kick things off. And while I knew the good turnaround couldn't last because his schizophrenia and hallucinations are a major aspect of the show, I wasn't prepared for them to go so quick. However, Pierce's hallucination - who was stuck on repeating the concept of being gullible, or simply being the sound of a motorcycle - seemed rather forced in leading the intelligent doctor to his eventual conclusion. On top of that, the case at hand, involving a jealous biker who murdered his wife only to accidentally shoot himself and cause his brain to rewire essentially his personality into a sweet artistic and caring individual, was over the top. I know the show really likes to base its stories with true facts, but the case felt way out there, even if Pierce is the master of figuring out even the most daunting and outrageous of situations. While the concept was interesting, and it was great that Pierce was able to deduce the transformation, it never really felt believable. Then, to have the jury decide a "not guilty" verdict because Pierce said the biker was basically not the same person... and the brother of the murdered woman pretended that the biker should be let free? Maybe, if the jury was split. But it felt like a way to kill off the biker so he could be Pierce's hallucination and give viewers a twist. Not to mention there was the additional twist that I saw miles away leaving the eventual victory rather bland and unexciting. Trying to push the audience into thinking that the stereotyped biker friend or even at the last second, the father, was the killer wasn't as satisfying as the episode was pushing for. There were even moments of dialogue that were supposed to be funny - such as Pierce's assistant Lewicki trying to get a high five for Pierce getting laid - that seemed shoe-horned in. I know one of my complaints last season was a lack of humor, but there's no need to force it. Although I did think Pierce getting served by the beautiful woman was comedic. Watching Pierce deal with the pretty women he interacts with is always entertaining. And I do like the cast right on down to LeVar Burton, but it felt more like they were placed into an hour that simply rolled along through the usual beats rather than shining through as characters mixed with an engrossing story, something that the series had managed to accomplish by the end of season one. That said, the addition of Scott Wolf as Kate's ex, Donnie, was a pleasant surprise. Wolf normally plays such nice guys, so it was rather enjoyable watching him not be the knight in shining armor, although he clearly still has something for Kate. Hopefully, there's some good tension to be played amongst the three throughout this season. I do think watching Pierce, who seems invested in Natalie again, try and balance out all his relationships should prove good for the show as long as they focus on building his character based on the circumstances. I really want to see him work at finding a good balancing act between a level of sanity and turning the negatives of schizophrenia into something positive. Of course, my favorite part of the episode was the use of the bookend class discussion. Posing a two-sided question that is reflective of the hour, Pierce's character and something viewers can ponder is a great way to contain the story of the week. It always feels natural and the right way to close it all out. Overall, this was an average episode that dived right back into a more or less standard formula of solving a case of the week. The stories don't need to be so fantastical or out there to be compelling. And hopefully, as the season rolls out, Pierce and the characters that surround him continue to grow into people to care about and are important to the overall story. Maybe my Perception was blinded for this particular premiere, but I'm hoping to see far more from this series as I know it's certainly capable of standing out as a unique show with its solid cast.